It's a sure sign of ageing when all you can do when hearing of the tender ages of some newly emerging bands, is to exclaim: "They're how old?!" However, even those just hitting the 20-something decade may be given to feeling their age when finding that the youngest member of Los Angeles-based teen grunge rockers Love Ghost is but a mere 13 - yes, thirteen. Even the oldest member of the quintet - violist Mya - is still but 19, with vocalist Finn Bell hitting up at 15. The next thing that may be questioned is whether they are any good or not? Well, judging by Smashing Pumpkins and 90s grunge scene inspired debut single ‘Friday Afternoon’, they have a certain rawness to their distorted guitar melodies (get a load of those guitars in the last minute!) and heavy drums and bass line accompanied by a level of maturity in arrangements that belies their age. Lyrically it was written early last year by the then 14-year-old Bell. "The song’s inspiration came to me in an epiphany I had on top of my roof," he reveals. "It was a particularly difficult time in my life and I knew I had to stick up for myself. The song is about finding your voice really. And don't think that this is a one-track-pony band, for they have already released a six-song self-titled EP, produced by Mark Renk (P.O.D., Gavin Rossdale). Check their Facebook page for details of gigs in the LA area. 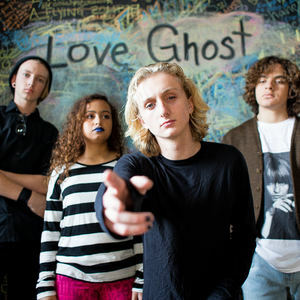 Love Ghost are: Finnegan Bell (vocals, guitar, piano, bell), Max Toth (lead guitar), Mya Greene (viola), Ryan Stevens (bass), Ale Sierra (drums, vocals).